The merchant John Scott, founder of the Sans Pareil, made his fortune with a washing blue of his invention, "Old True Blue," "for bluing stockings, fine and family linen and cotton also for dying silk, tiffeny [sic], gauze and for writing and drawing a most transparent blue" (advertisement qtd. in Alfred L. Nelson's "'True Blue' Scott and His Daughter at the Sans Pareil," p. 1). Scott also sold magic lanterns. One advertisement tells of "thirty magic, magnetic and fanciful entertainments for the fireside with instruction for their use, being upon an entirely new principle such as has not been seen in this country, being just received from his newly established manufactory in Saxony" (Nelson p. 2). John Scott's daughter Jane, a pupil of Dr. Arne at one time, gave singing and pianoforte lessons in the years preceding her Sans Pareil debut and wrote songs, some of which she offered for sale. She had also, in the words of W. C. Forman, "a passion for the stage, and a good deal of native talent" (W. Forman, "The Story of The Adelphi," Notes and Queries, June, 1930, p. 419). The Theatrical Observer made the same points about Miss Scott and described the obstacles she faced and the support her father gave her. Miss Scott developed strong symptoms of dramatic disease and though her extraordinary talent was undoubted by her father and friends, it was delicately hinted that the greedy public not only expected intrinsic merit for their money, but also that it must be hallowed o'er with beauty to secure the first impression. Now Miss Scott, in addition to some natural defects had the smallpox and rickets unfavourably, but as genius comes in all disguises, she really had great talent, both as an actress and a writer. Scott was induced to gut the back of his warehouse in The Strand, and fit it up as a theatre where his daughter might safely indulge her predilection for the stage. Here for some two or three years, assisted by some young people, her pupils, she dramatised and acted away to a subscription party of her own friends (December 11, 1844). Scott must have been convinced by these amateur theatricals, for he decided to replace the makeshift building with a small new private theatre, probably constructed in 1804, which was transformed into a well-appointed house in 1806. As Nelson observes, the time was right for opening a new popular theatre, and the shrewd Scott was well equipped for his venture: Scott "had the ingredients for a theatre: the magic lantern, his knowledge of fabrics such as those used in curtains, drapes, and screens; his skill as a dyer and colourer; and a talented daughter who could sing and play" (p. 3). "Old Scott," the Theatrical Observer said, "very wisely obtained a license for a minor performance chiefly provided by his clever daughter and, thinking of her alone, called [his theatre] The Sans Pareil and opened the doors to chance customers." The Theatre, a small house without a gallery, was built in 1806 by Mr. Jay of London Wall to the designs of the architect, Samuel Beazley (Howard, London Theatres and Music Halls, 1850-1950, p. 2). In fact, Jay was reconstructing the 1804 theatre. A notice of November 21, 1806 informs the public that "the theatre is perfectly dry, having been finished upwards of two years in a manner, the proprietors trust, will meet their approbation" (Adelphi Scrapbook). In his discussion of one-man shows, Richard L. Klepac places Miss Scott in a long line of English solo actors: Samuel Foote, George Alexander Stevens, Charles Lee Lewes, John Palmer, John Collins, Charles Dibdin (who would give one performance at the Sans Pareil in 1808), Rees, Jack Bannister, and later and also at the Sans Pareil/Adelphi, Charles Mathews (Mr. Mathews at Home, pp. 9-11). An evening at the Sans Pareil this season consisted of songs and recitations "written, composed spoken, sung, and accompanied by Miss Scott," followed by "an optical exhibition of visionary objects" and then a shadow play which included fireworks. 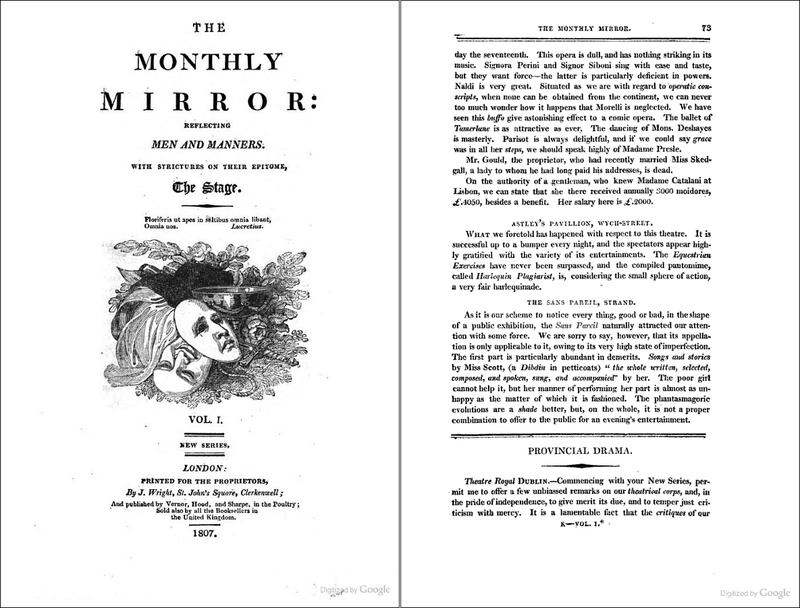 It appears that after January 11 the second and third parts of the bill were abbreviated and re-titled, and Jane M. Scott's new entertainment, Rural Visitors; or, Singularity, possibly longer than her first entertainment, The Rout (advertised to run forty-five minutes), became the main attraction. Strictly speaking, none of the entertainments this season was dramatic. Each piece has been entered in the calendar as if it were so that the reader will have an idea of what was performed. The "optical exhibition of visionary objects" was described as "something in the manner of the Phantasmagorias." It was, like the Paris and Lyceum Phantasmagorias, a ghost show, calling up the famous dead (including the Man in Iron Mask, Jane Shore and Ixion on the wheel). Richard Altick says the Lyceum profited "from the same popular relish for managed spectral visitations" that explained the popularity of Gothic novels (The Shows of London, p. 217). Obviously, the Scotts hoped to profit in the same way. If John Scott's machinery resembled that of the Phantasmagoria, "the source of light was a magic lantern placed at a distance behind a semitransparent screen a movable carriage and adjustable lenses enabled the images to be increased or decreased as the effect (the illusion of ominously advancing or retreating figures) required. The ghostly figures were painted on glass 'sliders,' the extraneous parts of which were blacked out so as to concentrate the light, and the audience's fearful attention, on the luminous images" (Altick p. 217). Part two of the Sans Pareil program, then—in Altick's phrase this "frisson-filled communion with visible spirits"—must have contrasted sharply with Miss Scott's rendition of "Sweet Content" or her recitation of "Picklewell" in part one. The third part of the entertainment, Vision in the Holy Land, or Godfrey of Bouillon's Dream, the narrative for which was written by Miss Scott, was a spectacle "representing, apparently in the air, an ancient grand battle in shadow, in which several thousand figures, armed in the costume of their time, are seen engaged." The reviewers this season meted out both excessive praise and blunt criticism. An 18 December review (a news clip of which is in James Winston's Adelphi Scrapbook) said that one of Miss Scott's songs "was rapturously applauded" and that one of her anecdotes "convulsed the audience with laughter." A 12 January review deemed Rural Visitors "the best entertainment of the kind that ever appeared before the public." But the Monthly Mirror of 7 January was less polite: "The first part is particularly abundant in demerits: songs and stories by Miss Scott (a Dibdin in petticoats). The poor girl cannot help it, but her manner of performing her part is almost as unhappy as the matter of which it is fashioned. The phantasmagoric evolutions are a shade better, but on the whole, it is not a proper combination to offer the public for an evening's entertainment." George Frederick Cooke liked at least some of what he saw when he attended the theatre in 1806. His brief diary comment says much: "Miss Scott provided the first part of the entertainment at the Sans Pareil. The second and third parts of the entertainment are very pleasing" (quoted in Harold Scott, The Early Doors, p. 94). It is not known whether The Season was a financial success. One review suggests attendance was not very good: "The audience was numerous but not full; but we are persuaded it will be bumper every evening, when more generally known to the public." At about the time of this review, in early December, 1806, John Scott reduced ticket prices from five to four shillings for box seats and places in the pit cost half a crown instead of four shillings. It is possible the opening was scheduled for the 17th and had to be postponed. However, there was an advertisement published for a performance on the 19th. The advertisement for the 27th, makes no mention of its being the theatre's opening night. A song composed by Miss Abrams, words by Miles Peter Andrews, was also sung (Scrapbook, 8 Dec. 1806). Nicoll and Hartnoll etc. give 27 November 1806 as the opening night perhaps because a New York announcement has a MS note "opened November 27"
Times states "this present Monday and every succeeding M W F"
Theatres were usually dark on Martyr's Day. There may not have been a performance on this night. "Every evening during Lent, Wednesday and Fridays excepted"
Sans Pareil Theatre. Doors open 7:00, curtain 8:00 (7:30 and 8 after Dec. 2, 1806). Ticket prices: box 5/-, Pit 3/-, (4/- and 2/6 after Dec. 2, 1806). There was no gallery.